The AIM-9 Sidewinder is a short-range air-to-air missile which entered service with the US Navy in 1956 and subsequently was adopted by the US Air Force in 1964. Since then the Sidewinder has proved to be an enduring international success, and its latest variants are still standard equipment in most western-aligned air forces. The Soviet K-13, a reverse-engineered copy of the AIM-9, was also widely adopted by a number of nations. Low-level development started in the late 1940s, emerging in the early 1950s as a guidance system for the modular Zuni rocket. This modularity allowed for the introduction of newer seekers and rocket motors, including the AIM-9C variant, which used semi-active radar homing and served as the basis of the AGM-122 Sidearm anti-radar missile. Originally a tail-chasing system, early models saw extensive use during the Vietnam War but had a low success rate. This led to all-aspect capabilities in the L version which proved to be an extremely effective weapon during combat in the Falklands War and the Operation Mole Cricket 19 ("Bekaa Valley Turkey Shoot") in Lebanon. Its adaptability has kept it in service over newer designs like the AIM-95 Agile and SRAAM that intended to replace it. The Sidewinder is the most widely used air-to-air missile in the West, with more than 110,000 missiles produced for the U.S. and 27 other nations, of which perhaps one percent have been used in combat. It has been built under license by some other nations including Sweden, and can even equip helicopters, such as the Bell AH-1Z Viper. The AIM-9 is one of the oldest, least expensive, and most successful air-to-air missiles, with an estimated 270 aircraft kills in its history of use. When firing a Sidewinder,[i] NATO pilots use the brevity code FOX-2. The United States Navy hosted a 50th-anniversary celebration for the Sidewinder in 2002. Boeing won a contract in March 2010 to support Sidewinder operations through to 2055, guaranteeing that the weapons system will remain in operation until at least that date. Air Force Spokeswoman Stephanie Powell noted that due to its relatively low cost, versatility, and reliability it is "very possible that the Sidewinder will remain in Air Force inventories through the late 21st century". An AIM-9 Sidewinder striking a QF-80 target drone. The Sidewinder improved on the World War II-era Madrid IR range fuze used by Messerschmitt's Enzian experimental surface-to-air missile. The first innovation was to replace the "steering" mirror with a forward-facing mirror rotating around a shaft pointed out the front of the missile. The detector was mounted in front of the mirror. When the long axis of the mirror, the missile axis and the line of sight to the target all fell in the same plane, the reflected rays from the target reached the detector (provided the target was not very far off axis). Therefore, the angle of the mirror at the instant of detection (w1) estimated the direction of the target in the roll axis of the missile. Sidewinder Missile at Udvar-Hazy Center in Chantilly, Virginia, USA. During World War II, various researchers in Germany designed infrared guidance systems of various complexity. The most mature development of these, codenamed Hamburg, was intended for use by the Blohm & Voss BV 143 glide bomb in the anti-shipping role. Hamburg used a single IR photocell as its detector along with a spinning disk with lines painted on it, alternately known as a "reticle" or "chopper". The reticle spun at a fixed speed, causing the output of the photocell to be interrupted in a pattern, and the details of this pattern indicated the bearing of the target. Although Hamburg and similar devices like Madrid were essentially complete, the work of mating them to a missile had not been carried out by the time the war ended. In the immediate post-war era, Allied military intelligence teams collected this information, along with many of the engineers working on these projects. Several lengthy reports on the various systems were produced and disseminated among the western aircraft firms, while a number of the engineers joined these companies to work on various missile projects. By the late 1940s a wide variety of missile projects were underway, from huge systems like the Bell Bomi[clarification needed] to small systems like air-to-air missiles. By the early 1950s, both the US Air Force and Royal Air Force had started major IR seeker missile projects. AIM-9Ds armed F-4B of VF-111 on USS Coral Sea. The next major advance in IR Sidewinder development was the AIM-9L ("Lima") model which was in full production in 1977. This was the first "all-aspect" Sidewinder with the ability to attack from all directions, including head-on, which had a dramatic effect on close-in combat tactics. Its first combat use was by a pair of US Navy F-14s in the Gulf of Sidra in 1981 versus two Libyan Su-22 Fitters, both of the latter being destroyed by AIM-9Ls. Its first use in a large-scale conflict was by the United Kingdom during the 1982 Falklands War. In this campaign the "Lima" reportedly achieved kills from 80% of launches, a dramatic improvement over the 10–15% levels of earlier versions, scoring 17 kills and 2 shared kills against Argentine aircraft. 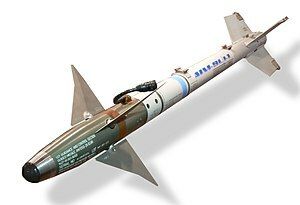 The Navy began development of AIM-9R, a Sidewinder seeker upgrade in 1987 that featured a focal-plane array (FPA) seeker using video-camera type charge-coupled device (CCD) detectors and featuring increased off-boresight capability. The technology at the time was restricted to visual (daylight) use only and the USAF did not agree on this requirement, preferring another technology path. AIM-9R reached flight test stage before it was cancelled and subsequently both services agreed to a joint development of the AIM-9X variant. 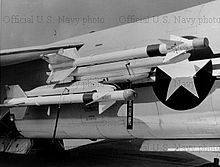 After looking at advanced short range missile designs during the AIM portion of the ACEVAL/AIMVAL Joint Test and Evaluation at Nellis AFB in the 1974–78 timeframe, the Air Force and Navy agreed on the need for the Advanced Medium Range Air-to-Air Missile AMRAAM. However, agreement over development of an Advanced Short Range Air-to-Air Missile ASRAAM was problematic and disagreement between the Air Force and Navy over design concepts (Air Force had developed AIM-82 and Navy had flight-tested Agile and flown it in AIMVAL). Congress eventually insisted the services work on a joint effort resulting in the AIM-9M, thereby compromising without exploring the improved off boresight and kinematic capability potential offered by Agile. In 1985, the Soviet Union did field a short range missile (SRM) (AA-11 Archer/R-73) that was very similar to Agile. At that point, the Soviet Union took the lead in SRM technology and correspondingly fielded improved Infrared Counter Measures (IRCM) to defeat or reduce the effectiveness of the latest Sidewinders. With the reunification of Germany and improved relations in the aftermath of the Soviet Union, the West became aware of how potent both the AA-11 and IRCM were and SRM requirements were readdressed. For a brief period in the late 1980s, an ASRAAM effort led by a European consortium was in play under a Memorandum Of Agreement with the United States in which AMRAAM development would be led by the US and ASRAAM by the Europeans. The UK worked with the aft end of the ASRAAM and Germany developed the seeker (Germany had first-hand experience improving the Sidewinder seeker of the AIM-9J/AIM-9F). By 1990, technical and funding issues had stymied ASRAAM and the program appeared stalled, so in light of the threat of AA-11 and improved IRCM, the US embarked on determining requirements for AIM-9X as a counter to both the AA-11 and improved IRCM features. The first draft of the requirement was ready by 1991 and the primary competitors were Raytheon and Hughes. Later, the UK resolved to revive the ASRAAM development and selected Hughes to provide the seeker technology in the form of a high off-boresight capable Focal Plane Array. However, the UK did not choose to improve the turning kinematic capability of ASRAAM to compete with AA-11. As part of the AIM-9X program, the US conducted a foreign cooperative test of the ASRAAM seeker to evaluate its potential, and an advanced version featuring improved kinematics was proposed as part of the AIM-9X competition. In the end, the Hughes-evolved Sidewinder design, featuring virtually the same British funded seeker as used by ASRAAM, was selected as the winner. Testing work on the AIM-9X Block II version began in September 2008. The Block II adds Lock-on After Launch capability with a datalink, so the missile can be launched first and then directed to its target afterwards by an aircraft with the proper equipment for 360 degree engagements, such as the F-35 and F-22. By January 2013, the AIM-9X Block II was about halfway through its operational testing and performing better than expected. NAVAIR reported that the missile was exceeding performance requirements in all areas, including lock-on after launch (LOAL). One area where the Block II needs improvement is helmetless high off-boresight (HHOBS) performance. It is functioning well on the missile, but performance is below that of the Block I AIM-9X. The HHOBS deficiency does not impact any other Block II capabilities, and is planned to be improved upon by a software clean-up build. Objectives of the operational test were due to be completed by the third quarter of 2013. However, as of May 2014 there have been plans to resume operational testing and evaluation (including surface-to-air missile system compatibility). As of June 2013[update], Raytheon has delivered 5,000 AIM-9X missiles to the armed services. CSIST Sky Sword I (TC-1) is a Taiwanese development of the AIM-9L originally meant to arm the ROCAF's indigenous F-CK-1 fighter. A ground-launched version was since developed as part of the Antelope air defence system, being carried on a Humvee-based launcher vehicle. The Pelican-Hardigg Technical Packaging division of Pelican Products Inc. has designed, qualified, and now manufactures a single missile AUR (All Up Round) Container for this missile. The Pelican-Hardigg Missile Container has been designed to be light enough for the loaded container to be physically handled by 6 men. ^ a b c d e f g Sea Power (January 2006). Wittman, Amy; Atkinson, Peter; Burgess, Rick, eds. "Air-to-Air Missiles". 49 (1). Arlington, Virginia: Navy League of the United States: 95–96. ISSN 0199-1337. ^ "GAO-15-342SP DEFENSE ACQUISITIONS Assessments of Selected Weapon Programs" (PDF). US Government Accountability Office. March 2015. p. 61. Retrieved 15 July 2015. ^ Military Technology (August 2008). "News Flash". 32 (8). Heilsbachstraße 26 53123 Bonn-Germany: Mönch Publishing Group: 93–96. ISSN 0722-3226. "Alliant Techsystems and RUAG Aerospace have signed a teaming agreement to provide full-service and upgrade support of the AIM-9P-3/4/5 Sidewinder family of IR-guided short-range air-to-air missiles. ^ "Air Weapons: Beyond Sidewinder". www.strategypage.com. Archived from the original on 3 February 2010. Retrieved 2 February 2010. ^ a b "Raytheon AIM-9 Sidewinder". www.designation-systems.net. Archived from the original on 9 February 2010. Retrieved 2 February 2010. ^ Echo-locating bats, as they pursue flying insects, also adopt such a strategy, see this PLoS Biology report: Ghose, K.; Horiuchi, T. K.; Krishnaprasad, P. S.; Moss, C. F. (18 April 2006). "Echo-locating Bats Use a Nearly Time-Optimal Strategy to Intercept Prey". PLoS Biology. 4 (5): e108. doi:10.1371/journal.pbio.0040108. PMC 1436025. PMID 16605303. ^ a b Kutzscher, Edgar (1957). "The Physical and Technical Development of Infrared Homing Devices". In Benecke, T; Quick, A. History of German Guided Missiles Development. NATO. ^ a b c d e f g h i j k Tom Hildreth (March–April 1988). "The Sidewinder Missile". Air-Britain Digest. 40 (2): 39–40. ISSN 0950-7434. ^ "U.S. Naval Museum of Armament & Technology". Archived from the original on 23 September 2015. Retrieved 26 March 2015. ^ Secret City: A history of the Navy at China Lake. OCLC 851089182. ^ Westrum, Ron (2013). 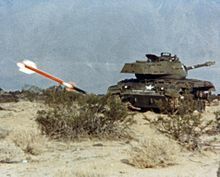 Sidewinder: Creative Missile Development at China Lake. Annapolis, Maryland: U.S. Naval Institute. ISBN 978-1-59114-981-1. ^ Friedman, Norman (1989). The Naval Institute Guide to World Naval Weapon Systems. Annapolis, Maryland: Naval Institute Press. p. 439. ISBN 978-1-55750-262-9. ^ a b c Carlo, Kopp (1994-04-01). "The Sidewinder Story; The Evolution of the AIM-9 Missile". Australian Aviation. 1994 (April). ^ Bonds 1989, p. 229. ^ "F-16 Armament – AIM-9 Sidewinder". Retrieved 26 March 2015. ^ Doty, Steven R. (2008-02-29). "Kunsan pilots improve capability with AIM-9X missile". Air Force Link. Archived from the original on 2 March 2008. Retrieved 2008-02-29. ^ "Successful Test of an AIM-9X Missile by a Raytheon-Led Team Demonstrates Potential for Low Cost Solution in Littoral Joint Battlespace". 29 September 2007. ^ "Raytheon AIM-9X Block II Air/Air Missile." Defense Update, 20 September 2011. ^ "Raytheon AIM-9X Block II Missile Completes First Captive Carry Flight". Raytheon. September 18, 2008. Retrieved November 2, 2018. ^ "Raytheon AIM-9X Block II Missile Completes First Captive Carry Flight". Retrieved 26 March 2015. ^ David C. Isby (May 2014). "AIM-9X Block II resumes IOT&E". Jane's International Defence Review. 47: 16. ISSN 2048-3449. ^ Sweetman, Bill (June 19, 2013). "Raytheon Looks At Options For Long-Range AIM-9". Aviation Week. Retrieved 2013-06-23. ^ "marketing redirect". Archived from the original on 29 March 2015. Retrieved 26 March 2015. ^ "AIM-9X Sidewinder demonstrates Air-To-Surface capability". Retrieved 26 March 2015. ^ "PressTV-Iran's IRGC unveils new anti-armor missile". Retrieved 2018-03-04. ^ "1970 China Lake Photo Gallery". www.chinalakealumni.org. ^ La Franchi, Peter (27 March 2007). "Australia confirms AIM-9X selection for Super Hornets". Flight International. Retrieved 20 April 2011. ^ a b c d e f g h i j k l m n o p q r s Jennings, Gareth. "Norway and Taiwan join AIM-9X Block II user-community | IHS Jane's 360". IHS Jane's 360. London. ^ "International Market Research - Defense Trade Guide Update 2003". 13 October 2007. Archived from the original on 13 October 2007. ^ "Finland Ordering 150 AIM-9X Sidewinders". ^ "Taking On Iran's Air Force – Defense Tech". 2006-05-17. Retrieved 26 March 2015. ^ "PH completes inspection of Raytheon for FA-50's air-to-air missiles - Update Philippines". 18 July 2017. ^ "150 AIM-9 Sidewinder Missiles for Saudi Arabia". ^ "SIPRI arms transfer database". Stockholm International Peace Research Institute. 19 March 2012. Retrieved 27 April 2012. ^ "Turkey Buys 127 AIM-9X Sidewinder Missiles". ^ "AIM-9B Sidewinder". South African Air Force Association. Archived from the original on 27 June 2008. Retrieved 2008-08-04. Bonds, Ray ed. The Modern US War Machine. New York City: Crown Publishers, 1989. ISBN 0-517-68802-6. Bonds, Ray and David Miller (2002-08-05). "AIM-9 Sidewinder". Illustrated Directory of Modern American Weapons. Zenith Imprint, 2002. ISBN 978-0-7603-1346-6. Clancy, Tom (1996). "Ordnance: How Bombs Got 'Smart'". Fighter Wing. London: HarperCollins, 1995. ISBN 978-0-00-255527-2.